VMware View 4.6 has been released. Andre Leibovici has a nice summary of the PCoIP Software Gateway (PSG) functionality – new in 4.6 – that finally allows PCoIP to be negotiated without external VPN tunnels. VMware View 4.6 has been just released and as everyone expected this release introduces support for external secure remote access with PCoIP, without requirement for a SSL VPN. This feature is also known as View Secure Gateway Server. VMware’s Mark Benson, in his blog article, does a very good job explaining why tunnelling PCoIP traffic through the Security Server using SSL was never a viable solution because VMware didn’t want to interfere with the advanced performance characteristics of the protocol. New timeout setting for SSO users – With the single-sign-on (SSO) feature, after users authenticate to View Connection Server, they are automatically logged in to their View desktop operating systems. This new timeout setting allows administrators to limit the number of minutes that the SSO feature is valid for.For example, if an administrator sets the time limit to 10 minutes, then 10 minutes after the user authenticates to View Connection Server, the automatic login ability expires. If the user then walks away from the desktop and it becomes inactive, when the user returns, the user is prompted for login credentials. For more information, see the VMware View Administration documentation. SOLORI’s Take: The addition of WAN-enabled PCoIP functionality takes VMware’s flagship desktop protocol to the next level. However, considerable tuning at the PCoIP desktop agent is necessary for most WAN configurations. The upside is the solution maintains PCoIP’s UDP basis without tunneling inside TCP. Since PCoIP has always been AES encrypted by default, this is not really an issue of security but one of performance and delivery. Right-sizing the PCoIP payload for the intended WAN application will be challenging for most, so expect to see PSG use in campus-wide applications where security of PCoIP (UDP) has been difficult. For a twist on PSG using Internet connections with dynamically assigned IP addresses, check-out Gabe’s Virtual World post – powershell included! Merry Christmas and happy holidays from our family to yours! God has truly blessed us this year, and we’ve been privileged to share some of those blessings with you. Read the rest of this entry ? 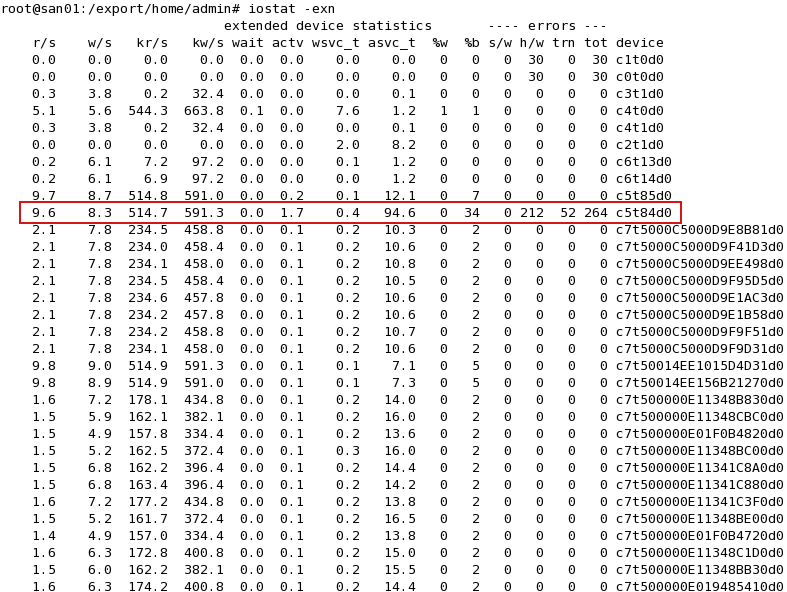 When volumes fail in ZFS, the “final” indicator is data corruption. Fortunately, ZFS checksums recognize corrupted data and can take action to correct and report the problem. But that’s like treating cancer only after you’ve experienced the symptoms. 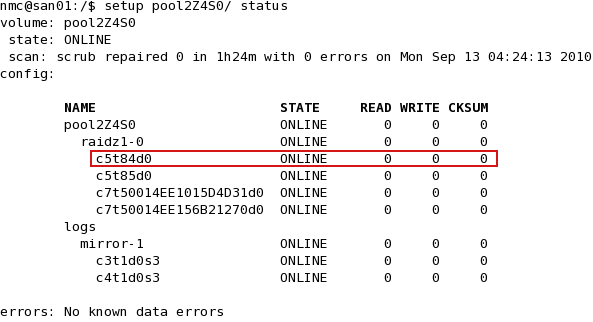 In fact, the failing disk will likely begin to “under-perform” well before actual “hard” errors show-up as read, write or checksum errors in the ZFS pool. Depending on the reason for “under-performing” this can affect the performance of any controller, pool or enclosure that contains the disk. Device c5t84d0 is having some serious problems. Busy time is 7x higher than counterparts, and its average service time is 14x higher. As a member of a RAIDz group, the entire group is being held-back by this “under-performing” member. From this snapshot, it appears that NexentaStor is giving us some good information about the disk from the “web GUI” but this assumption would not be correct. In fact, the “web GUI” is only reporting “real time” data so long as the disk is under load. In the case of a lightly loaded zpool, the statistics may not even be reported. Device statistics from 'iostat' show error and I/O history. SCSI error with ioc_status=0x8048 reported in /var/log/messages for failing device. Problems with disk device as yet undetected at the zpool layer. This doesn’t mean that the “consumers” of the zpool’s resources are “unaware” of the problem, as the disk error has manifested itself in the zpool as higher delays, lower I/O through-put and subsequently less pool bandwidth. In short, if the error is persistent under load, the drive has a correctable but catastrophic (to performance) problem and will need to be replaced. If, however, the error goes away, it is possible that the device driver has suitably corrected for the problem and the drive can stay in place. Here’s a maintenance note for SMB environments attempting 100% virtualization and relying on SAN-based file shares to simplify backup and storage management: beware the chicken-and-egg scenario on restart before going home to capture much needed Zzz’s. If your domain controller is virtualized and it’s VMDK file lives on SAN/NAS, you’ll need to restart SMB services on the NexentaStor appliance before leaving the building. Using auto-startup order on the remaining ESX host for AD and vCenter could automate the process (steps 17 & 19), however, I prefer the “manual” approach after a SAN upgrade in case the upgrade failure is detected only after ESX host is restarted (i.e. storage service interaction in NFS/iSCSI after upgrade). Since even vSphere Essentials Plus has vMotion now (a much requested and timely addition) collapsing all remaining VM’s to a single ESX host is a no brainer. However, migrating the storage is another issue which cannot be resolved without either a shutdown of the VM (off-line storage migration) or Enterprise/Enterprise Plus version of vSphere. That is why the migration of the AD server from tier-2 is reserved for last (step 17) – it will likely need to be shutdown to migrate the storage between SAN/NAS appliances. Obviously the big topic was the new AMD Opteron™ 6000 Series platforms that will be launching very soon. We had plenty of party favors – everyone walked home with a new 12-core AMD Opteron 6100 Series processor, code name “Magny-Cours”. We demonstrated a benchmark running on two servers, one based on the Six-Core AMD Opteron processor codenamed “Istanbul,” and one 12-core “Magny-Cours”-based platform. You would have seen that the power consumption for the two is about the same at each utilization level. However, there is one area where there was a big difference – at idle. The “Magny-Cours”-based platform was actually lower! 3. Performance in scaled virtualization matters – raw single-threaded performance is secondary. In virtual architectures, clusters of systems must perform as one in an orchestrated ballet of performance and efficiency seeking. For some clusters, dynamic load migration to favour power consumption is a priority – relying on solid power efficiency under high load conditions. For other clusters, workload is spread to maximize performance available to key workloads – relying on solid power efficiency under generally light loads. For many environments, multi-generational hardware will be commonplace and AMD is counting on its wider range of migration compatibility to hold-on to customers that have not yet jumped ship for Intel’s Nehalem-EP/EX. SOLORI’s Take: It would appear that Magny-Cours has more under the MCM hood than a pair of Istanbul processors (as previously charged.) To manage better idle performance and constant power performance in spite of a two-to-one core ratio and similar 45nm process, AMD’s process and feature set must include much better power management as well, however, core speed is not one of them. With the standard “Maranello” 6100 series coming in at 1.9, 2.1 and 2.2 GHz with an HE variant at 1.7GHz and SE version running at 2.3GHz, finding parity in an existing cluster of 2.4, 2.6 and 2.8 GHz six-core servers may be difficult. Still, Maranello/G34 CPUs will be at 85, 115 and 140W TDP. As we’ve said before, memory capacity and bandwidth (as a function of system power and core/thread capacity) are key factors in a CPU’s viability in a virtualization stack. With 12 DIMM slots per CPU (3-DPC, 4-channel), AMD inherits an enviable position over Intel’s current line-up of 2P solutions by being able to offer 50% more memory per cluster node without resorting to 8GB DIMMs. That said, it’s up to OEM’s to deliver rack server designs that feature 12 DIMM per CPU and not hold-back with only 8 DIMM variants. In the blade and 1/2-size market, cramming 8 DIMM per board (effectively 1-DPC for 2P Magny-Cours) can be a challenge let alone 24 DIMMs! Perhaps we’ll see single-socket blades with 12 DIMMs (12-cores, 48/96GB DDR3) or 2P blades with only one 12 DIMM memory bank (one-hop, NUMA) in the short term. SOLORI’s 2nd Take: It makes sense that AMD would showcase their leading OEM partners because their success will be determined on what those OEM’s bring to market. With VDI finally poised to make a big market impact, we’d expect to see the first systems delivered with 2-DPC configurations (8 DIMM per CPU, economically 2.5GB/core) which could meet both VDI and HPC segments equally. However, with Window7 gaining momentum, what’s good for HPC might not cut it for long in the VDI segment where expectations of 4-6 VM’s per core at 1-2GB/VM are mounting. Besides the launch date, what wasn’t said was who these OEM’s are and how many systems they’ll be delivering at launch. Whoever they are, they need to be (1) financially stronger than AMD, (2) in an aggressive marketing position with respect to today’s key growth market (server and desktop virtualization), and (3) willing to put AMD-based products “above the fold” on their marketing and e-commerce initiatives. AMD needs to “represent” in a big way before a tide of new technologies makes them yesterday’s news. We have high hopes that AMD’s recent “perfect” execution streak will continue. You are currently browsing the archives for the Quick Take category.